The warm sea threatens to take out the 'great' in Great Barrier Reef. It’s a threat people can see from a mile away but still, the news is quite shocking. Andrew Baird, a researcher at James Cook University has reported that warm seas around Australia’s Great Barrier Reef are causing coral to die out. One stretch of coral that measures 700-km (435 miles) long has already been depleted by two-thirds. It’s now being called the biggest die-off within the Great Barrier Reef system. “The coral is essentially cooked,” said Baird on a telephone interview with Reuters. The coral in the area has experienced massive bleaching caused by rising sea temperatures. This rise forces the corals to expel algae causing it to calcify and turn white. 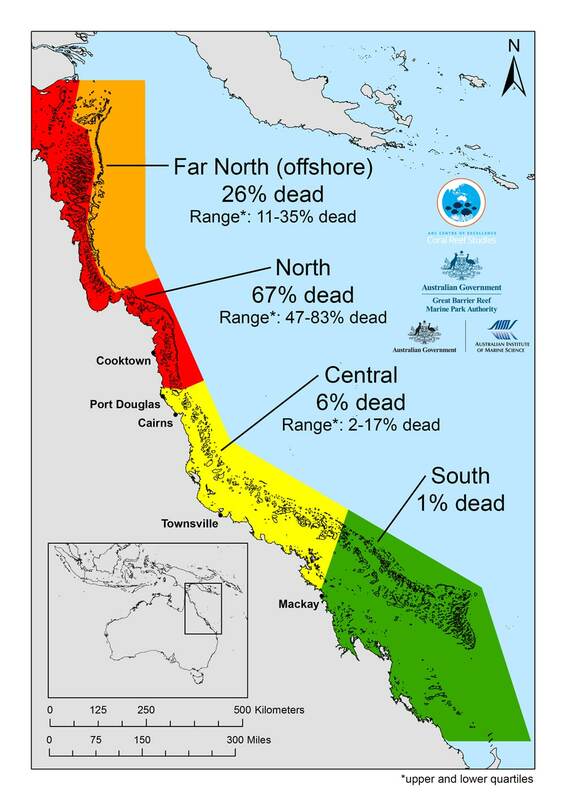 A media release from the ARC Centre of Excellence for Coral Reef Studies reports 67 percent of shallow-water coral along the northern areas in the Great Barrier Reef has been lost. The die-off of the corals may be temporary though, as the Great Barrier Reef could still recover once the sea temperatures return to normal levels. Scientists estimate a 5-10 year recovery period for that area barring another bleaching event. The Paris Agreement hopes to solve this by having countries lessen their carbon emissions that contribute to the rising temperatures in the world. It’s a crucial measure for the Great Barrier Reef, as scientists warn that climate change may stifle the reef’s ability to repair itself.